* It's very annoying to see the mouse battery instead of the system battery on indicator bar. * Using Logitech Wireless Mouse M325 or other wireless mouse can see this issue. * No regression as I know. * This is a SRU request for Ubuntu 16.04 (xenial). The power indicator shows the battery level for cordless mice and keyboards, even when it cannot identify the battery level. This is a problem as it seems to favour showing a "not present" mouse status over the laptop battery level in the top bar. 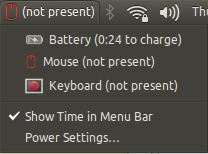 Basically, the laptop battery should be shown in the top bar if the mouse/keyboard is "not present". I just wanted to report the same. Even though my mouse battery status can be read I am a lot more interested in my laptop battery. Examining /sys/class/power_supply/*/ it looks as if the sort function could take into account the 'capacity' node of all batteries since it looks to be the only common value shared across laptop and external device batteries. I've not yet discovered the unit of measure so far though, so it might not be the most suitable value. The key thing is to be able to recognise and differentiate the treatment of internal laptop batteries (of which there can be more than one) from external device batteries (mice, keyboard, headphones, etc.). It may be that the simplest most flexible solution would be to add an option to the Power Settings GUI that allows the user to make an intelligent decision as to which battery/batteries they wish to be considered as the primaries for purposes of the indicator icon. How about marking anything that is connected over bluetooth as a secondary? I just updated to 13.10 and was hit by this bug, so I coded a patch that introduces a new configuration setting and menu alternative to prefer laptop batteries over other devices, regardless of (dis)charging status. Belated thanks to TJ for that good analysis. Second, even when the menu does contain a "(not present)" component, it shouldn't end up as the primary device when any other devices are charging or discharging. Both of those should be fixed, but if *either* was fixed, Stephen wouldn't have experienced the bug. Peter, thanks for the proposal, but I don't think that would solve the problem. If someone connected their notebook to power and removed its battery, with your alternative they'd still see "not present" in the menu bar even when something more urgent was going on, like a wireless keyboard about to expire. Matthew, this was the closest bug I found for the problem I experienced in having a mouse indication that I don't care about (and others too: http://askubuntu.com/questions/361022/how-to-disable-mouse-power-status-in-indicator-power). If you know a better bug please point me to it, or I can write one. Personally, I don't need notification if the keyboard or mouse is about to drop it's last little battery power, because worst-case I just have to flip the laptop lid open and use it that way. Gamers might feel different, so that's why I made it configurable. Is there a ppa or a debian package for download that contains Peters mod for 14.04? Why can't I just see multiple battery indicators in my panel? One for each peripheral? With a way to hide ones I don't care about? We try to stick to a rule that each indicator has one icon and/or one piece of text. If we diverged from that, it would be harder to tell when every indicator ended and the next began. it is critical on a laptop to be able to see wether the laptop battery is running low with a glance. Showing keyboard/mouse battery instead of laptop battery status obscures this vital info. @Gerry Boland, I am fan of your solution! This can't be this hard to implement!! Does anybody know, where to find the source code for that? The Ubuntu Wiki page at https://wiki.ubuntu.com/Power#settings seems to say that if the mouse battery is low, then it gets the battery indicator. In my opinion, this is fundamentally incorrect behaviour. If the PC has a battery then it is likely to be a laptop and therefore it's more important to display the laptop battery level instead of the mouse battery. I care if my laptop battery is about to go flat. I don't care at all if my mouse battery is only at 29% because my mouse will probably continue to work for many weeks whereas my laptop only works for a couple of hours from 100%. It would be better if there was a way to choose which battery level to display or have a way to completely ignore mouse battery readings. I encounter the same problem on Ubuntu 16.04 so I made this patch. I also created https://launchpad.net/~fourdollars/+archive/ubuntu/lp1100546 for Ubuntu 16.04. You can try it on your own system to see if this patch works or not. Oops, sorry that I disabled the unit tests locally so it can not be built in PPA yet. The attachment "indicator-power_12.10.6+16.04.20160105-0ubuntu1.debdiff" seems to be a debdiff. The ubuntu-sponsors team has been subscribed to the bug report so that they can review and hopefully sponsor the debdiff. If the attachment isn't a patch, please remove the "patch" flag from the attachment, remove the "patch" tag, and if you are member of the ~ubuntu-sponsors, unsubscribe the team. This patch passed the unit tests. This patch is for zesty. Thanks $4 for the patches! But the patch for 16.04 does not apply cleanly. It tries to patch src/device-provider-upower.c which does not exist. I'll drop the sponsor team subscription for now; if a fixed patch is uploaded, please re-add them. But src/device-provider-upower.c does exist. That's weird. Could you check it again? Echoing what Michael said in #24, unsubscribing ~ubuntu-sponsors. Please feel free to resubscribe and leave a comment if this was done in error. The mouse is one of the most important parts of a laptop and it plays a role of the indicator and helps us to swipe the cursor over the monitor, but if you are having an issue with the mouse, then https://epsonsupports.net/blog/epson-printer-not-printing/ will help you a lot in this regarding.